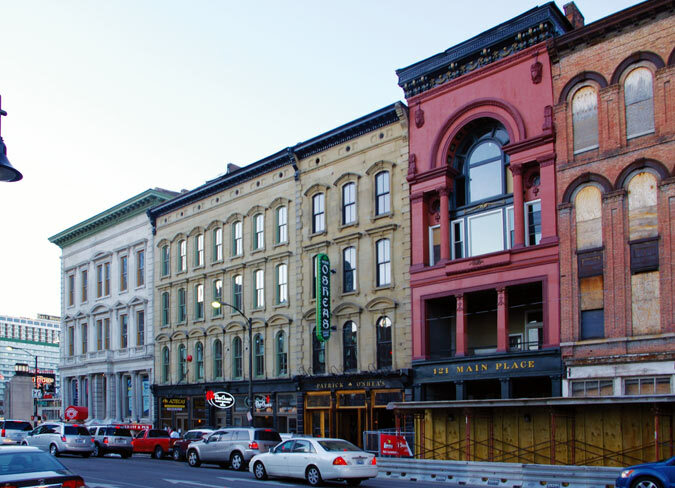 Under a new agreement, most of Louisville’s Whiskey Row block would be torn down. In the 1860s, a block of cast iron and brick warehouses on Louisville’s bustling waterfront was an epicenter of the bourbon industry. Today known as Whiskey Row, the block is in transition with a mix of new development on one end of the block and blighted abandonment on the other. Located a block away from a major new arena, two thirds of the landmarked block remains boarded up after decades of neglect. In a blow to preservationists and the local landmarks commission, the city has granted its demolition, to take place this May during the National Trust for Historic Preservation’s National Preservation Month. Preserving the block has been at the center of a contentious fight between the community and developer Todd Blue and his firm Cobalt Ventures. After purchasing seven buildings and a vacant lot, where another structure had collapsed from neglect, for $4.3 million in 2007, Blue once hoped to build a $50 million retail and office complex with a tower ascending from its center. Highly praised at the time, plans called for razing the structures while leaving their Main Street facades intact. The project languished in the recession, and Cobalt Ventures eventually sought to tear down the buildings citing public safety concerns. Four buildings on Whiskey Row have been renovated (left) and a detail of bourbon warehouses that could be demolished (right). 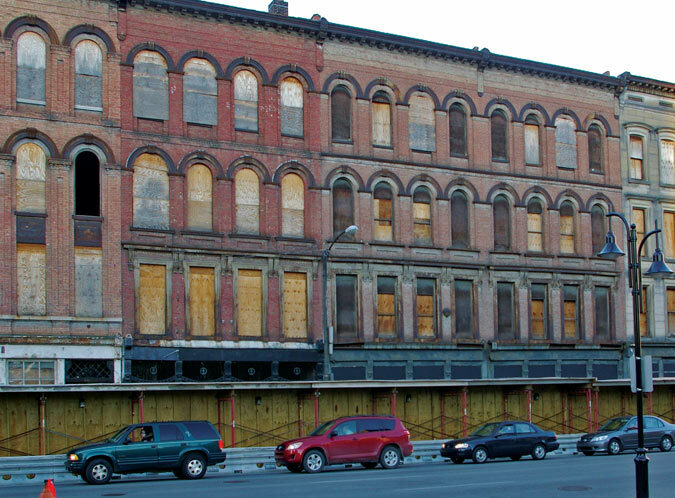 Preservation groups quickly spearheaded a petition drive resulting in seven buildings being designated local landmarks in June 2010, preventing demolition except for safety emergencies and economic hardship. The non-profit Downtown Development Corporation also issued an independent report suggesting that, while decayed, the buildings were salvageable. 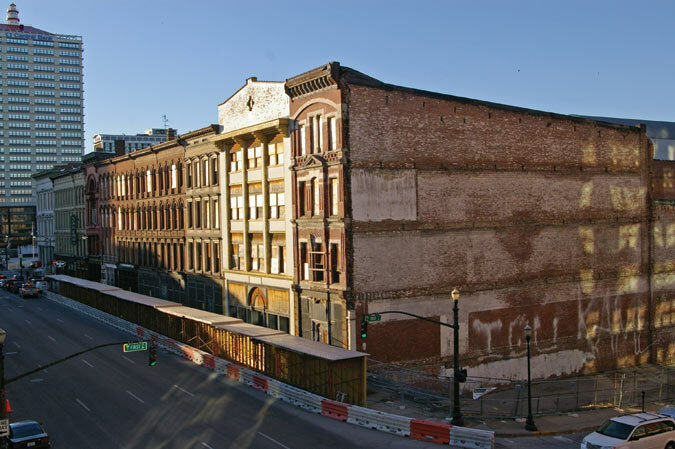 “If Whiskey Row is demolished, it would be the first group of individually landmarked buildings in Louisville history to be torn down,” said Stephen Porter, a Louisville attorney and preservationist. 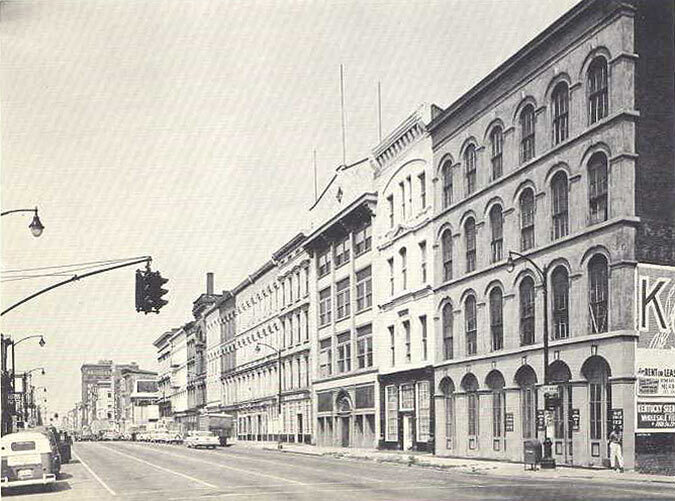 A historic view of Whiskey Row before the collapse of a corner building. According to the settlement, Cobalt Ventures will be issued a demolition permit after a 90-day stay, bypassing landmarks and overlay district review. In that time, the city will fund a study determining the feasibility of saving or rebuilding portions of the facades. According to Porter, Blue would also be allowed to build a surface level parking lot on the site for five years, which could be extended if development plans don’t materialize, requiring the review of the overlay district which denied the original demolition plan. “Mayor Fischer’s pro-business attitude is already apparent, and he’s less than 30 days into his administration,” Blue said in a statement.